A fantastic chance to see emerging work by a range of artists working with circus. An evening full of new ideas, different approaches and experimental skills served up fresh for your enjoyment. This is an opportunity to see the very latest acts being worked on by the incredible wealth of talent that lives and works in Bristol. Circomedia joins forces with Circus City to present this series of short circus pieces at the Trinity Arts Centre. Everyone has had dinner....there's nothing quite like the memories and feelings shared round a table of great company. This acrobatic creation, made by students on the Circomedia BTEC course, was inspired by the comfort, laughter, and hours of chatting during dinners of their lives. Sharing food is timeless, it brings joy and community and sometimes utter silliness. Blooming Out - A celebration of being female and feminine interpreted by two Brazilian clown women. 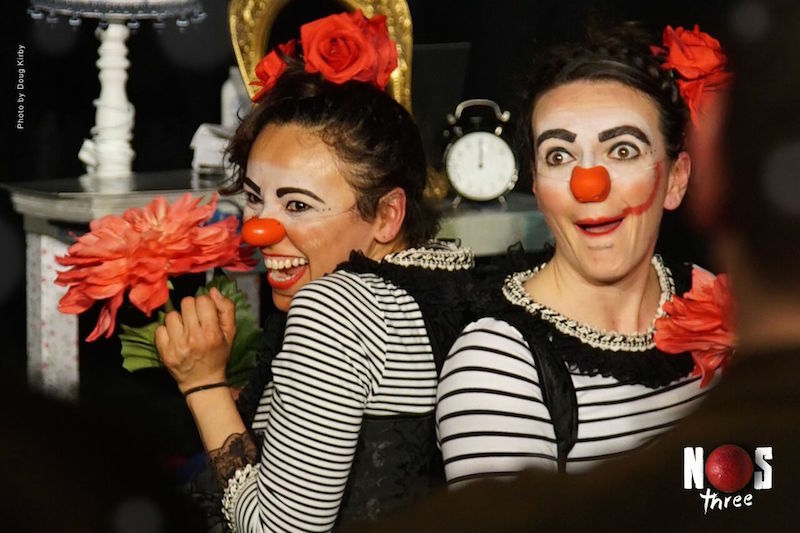 BLOOMING OUT is a clown show that explores in a light and comic way some of the most intriguing moments in the whole feminine universe. The fascination of beauty, the first time putting on make-up, the arrival of the period, maternity, love, the demands and social taboos, happiness and growing old. BLOOMING OUT is a clown show using non-verbal language, creating touching scenes of great power and beauty. Comic and poignant object manipulation performed by Juggler and Clown, Charles Brockbank, directed and choreographed by Mish Weaver. Mish Weaver has been working in circus for 24 years and has directed, choreographed or designed a myriad of performances including Box of Frogs and Backgammon for Beginners, circus facilitation for Parklife and Barricade with NoFit State Circus, and recently As A Tiger in the Jungle (on tour). She is Artistic Director of Stumble danceCircus. With this new short performance, Mish is returning to what she does best - choreography of movement with objects and employing high level circus technique to craft the essence of a character and their internal struggles. It is a timely exercise in working with fragmented imagery and nuanced expectations of circus, within the context of a global need for change. This unique two person act is a carefully measured mix of juggling, cocktail bar flaring, circus and theatre; it promises to be a new and exciting experience - high tempo, fun and entertaining.